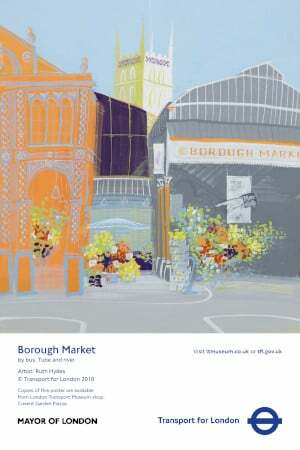 Poster that depicts Borough market with fruit and vegetable stores in the foreground and the spire of Southwark Cathedral in the background. Many of London's markets date back to medieval times. Their historic significance makes them as much a visitor attraction as a place to shop. As well as markets in the city, posters promoted travel to country markets by Green Line coach or country bus. 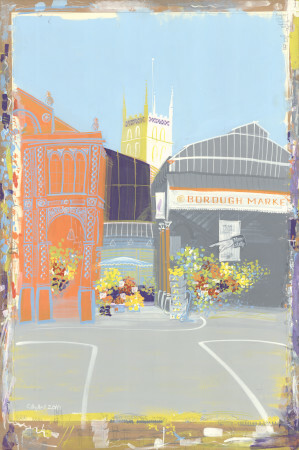 Recent posters tend to capture the vibrant colours and atmosphere experienced by the visitor. In the 1910s and 1920s however, they focused more on the tradition of the market profession. Double crown : Double crown is the descriptive size for posters that are 30 x 20 inches. This is slightly smaller than the standard double royal size, which is the most commonly used by the Underground. Double crown posters were originally displayed on the front panel of buses and the side panels of trams.